In human civilization, the concept of wind has been explored in mythology, influenced the events of history. Hot air balloons use the wind to take short trips, Wind powers the voyages of sailing ships across Earth’s oceans. How to measure wind speed? –Anemometer，Or called Wind Sensor. In today’s guide, you’re going to learn everything you need to know about different kinds of anemometers. It will certainly increase your awareness of anemometers in 2019. Wind direction is usually expressed in terms of the direction from which it originates. An anemometer or windmeter is a device used for measuring wind speed, and is a common weather station instrument. The term is derived from the Greek word anemos, meaning wind, and is used to describe any air speed measurement instrument used in meteorology or aerodynamics. The first known description of an anemometer was given by Leon Battista Alberti around 1450. The anemometer has changed little since its development in the 15th century. Leon Battista Alberti is said to have invented the first mechanical wind speed meter around 1450. In following centuries, numerous others, including Robert Hooke and the Mayans, developed their own versions, with some being mistakenly credited as the inventor. In 1846, John Thomas Romney Robinson improved upon the design by using four hemispherical cups and mechanical wheels. 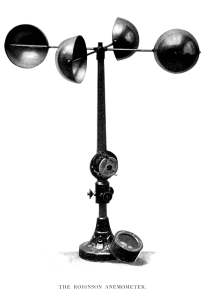 Later, in 1926, John Patterson developed a three cup anemometer, which was improved by Brevoort and Joiner in 1935. In 1991, Derek Weston added the ability to detect wind direction. Most recently, in 1994, Dr. Andrews Pflitsch developed the ultrasonic anemometer. Wind direction sensor is a kind of physical device that detects and senses the wind direction information. It works by the rotation of the arrow of the wind direction, and transmits it to the coaxial code plate, at the same time outputs the relevant values of the wind direction. 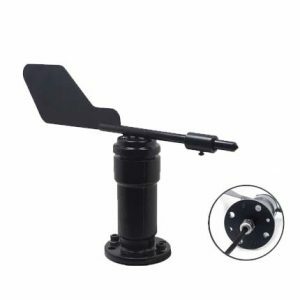 Usually the main body of the wind direction sensor adopts the mechanical structure of the wind vane. 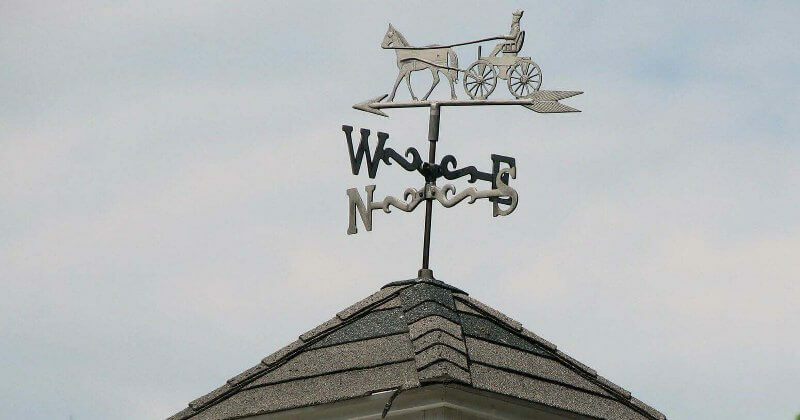 When the wind blows towards the tail of the wind vane, the arrow of the wind vane will point to the direction of the wind. Monitoring Principle The design is based on electromagnetic principle. Because there are many kinds of principles, so the structure is different. At present, some of these sensors have begun to use gyroscope chip or electronic compass as basic components, and their measurement accuracy has been further improved. This kind of wind direction sensor uses absolute gray code disc as the basic component, and uses special customized coding code. Based on the principle of photoelectric signal conversion, it can accurately output the corresponding wind direction information. 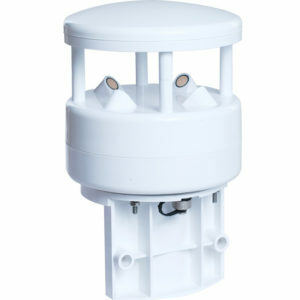 This kind of wind direction sensor adopts a structure similar to sliding rheostat. The maximum and minimum resistance values are marked as 360 degrees and 0 degrees respectively. When the wind direction indicator rotates, the sliding rod of the sliding rheostat rotates with the wind direction indicator at the top, and the different voltage changes can be used to calculate the angle or direction of the wind direction. Wind speed sensor is a kind of common sensor which can continuously measure the size of wind speed and wind volume (wind volume = wind speed × cross-sectional area). 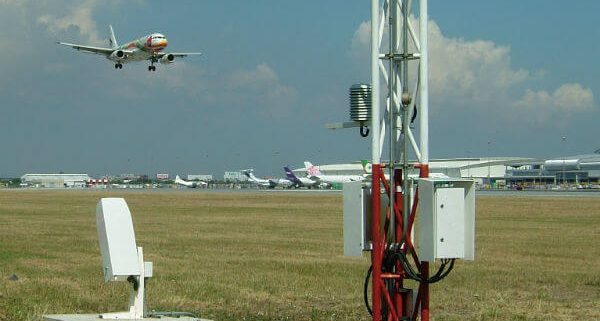 Wind speed sensors are generally divided into mechanical (mainly propeller type, cup type) wind speed sensor, hot wind type wind speed sensor, pitot tube wind speed sensor and ultrasonic wind speed sensor based on acoustic principle. We know that the motor drives the fan blade to rotate, which produces a pressure difference between front and back of the blade and drives the airflow. The working principle of the propeller anemometer is just the opposite. The blade system of the quasi-airflow is affected by the wind pressure, which produces a certain torque to make the blade system rotate. Generally, the propeller speed sensor measures the wind speed by rotating a group of three or four-blade propellers around the horizontal axis. The propeller is usually installed in the front of a wind vane, so that its rotating plane is always in the direction of the wind, and its speed is proportional to the wind speed. Wind cup wind speed sensor is a very common wind speed sensor. It was first invented by Robinson in England. The induction part consists of three or four empty conical or hemispherical cups. The hollow cup shell is fixed on the tripod star-shaped bracket with 120 degrees each other or the cross-shaped bracket with 90 degrees each other. The concave surface of the cup is arranged in one direction, and the whole cross-arm bracket is fixed on a vertical rotating axis. When the wind blows from the left, the wind cup 1 is parallel to the wind direction, and the pressure of the wind on the wind cup 1 is approximately zero in the direction most directly to the axis of the wind cup. Wind cup 2 and 3 intersect at 60 degrees in the same direction of wind. For wind cup 2, the concave face faces the wind and bears the greatest wind pressure; for wind cup 3, the convex face faces face faces the wind, and the wind bypass makes the wind pressure smaller than that of wind cup 2. Because of the pressure difference between wind cup 2 and wind cup 3 in the direction perpendicular to the axis of wind cup, the wind cup begins to rotate clockwise, the larger the wind speed, the greater the initial pressure difference, and the acceleration. The higher the degree, the faster the wind cup rotates. After the wind cup starts to rotate, because the cup 2 rotates in the direction of the wind, the wind pressure is relatively reduced, while the cup 3 rotates at the same speed against the wind. The wind pressure is relatively increased and the wind pressure difference decreases continuously. After a period of time (when the wind speed is constant), when the partial pressure difference on the three cups is zero, the wind cup turns into uniform speed. In this way, the wind speed can be determined according to the speed of the cup (the number of turns per second). When the wind cup rotates, the coaxial multi-tooth pick disc or magnetic rod is driven to rotate, and the pulse signal proportional to the speed of the wind cup is obtained through the circuit. The pulse signal is counted by the counter, and the actual wind speed value can be obtained after conversion. At present, three cups are used in the new type of rotor anemometer, and the performance of the conical cup is better than that of the hemisphere. When the wind speed increases, the rotor can rapidly increase the speed to adapt to the airflow speed. When the wind speed decreases, the speed can not immediately decrease due to the inertia effect. The wind speed indicated by the rotary anemometer in gust wind is generally too high to become an over-efficient effect (the average error is about 10%). Hot wire (tungsten wire or platinum wire) or hot film (platinum or chromium film) is used as the probe to expose the measured air and connect it to the Whiston Bridge. Through the resistance or current balance of the Whiston Bridge, the flow velocity of the measured cross-section air is detected. The hot film of the hot film type wind speed sensor is coated with a very thin quartz film insulating layer to insulate it from fluids and to prevent pollution. It can work in the airflow with particles, and its strength is higher than that of the metal hot wire. When the air temperature is stable, the power consumption on the hot wire is equal to the instantaneous heat consumption of the hot wire in the air. The resistance of hot wire varies with temperature. The resistance of hot wire and the temperature of hot wire are linear in the normal temperature range (0 – 300 C). The heat release coefficient is related to the airflow speed. The larger the flow speed, the larger the corresponding heat release coefficient, that is, the faster the heat dissipation is; the smaller the flow speed, the slower the heat dissipation is. The airflow velocity measured by the thermal wind speed sensor is a function of current and resistance. Keep the current (or resistance) unchanged, and the measured airflow velocity corresponds only to the resistance (or current) one by one. Pitot tube, also known as “airspeed tube” and “wind speed tube”, is a tubular device for measuring the total pressure and static pressure of airflow to determine the airflow speed. It was invented by H. Pitot of France. It is difficult to measure the velocity of airflow directly by experimental method, but the pressure of airflow can be measured conveniently by manometer. It is mainly used to measure the speed of aircraft, but also has a variety of other functions. Therefore, the pressure can be measured by pitot tube, and the velocity of air can be calculated by Bernoulli’s theorem. The working principle of the sonic anemometer is to use the ultrasonic time difference method to measure the wind speed. Because of the speed at which sound travels in the air, it superimposes the velocity at which it flows up the wind. If the direction of the ultrasonic wave is the same as that of the wind, its speed will be accelerated; otherwise, if the direction of the ultrasonic wave is opposite to that of the wind, its speed will be slowed down. Therefore, under the fixed detection conditions, the speed of ultrasonic propagation in the air can correspond to the wind speed function. Accurate wind speed and direction can be obtained by calculation. Sometimes wind compass can be built in. The rotating moment of the propeller is large and the inertia force is small. The propeller has good chasing performance to the wind speed and strong wind resistance (90-100m/s). It has the advantages of good chasing performance to the wind direction, good vibration control performance and so on. It is the same as the aircraft shape design concept. It is suitable for use on coastal, island and ocean-going ships. Anti-corrosion (sea water salinity) ability.. The start-up wind speed is larger, at 0.9m/s-1m/s. The breeze measurement area required for track and field or indoor sports venues cannot be used. It is most widely used. The most important wind sensor in meteorological industry. Regular maintenance, such as replacement of bearing grease. After a long time, the measured wind value is not uniform. High frequency response, up to 1 MHz. Mainly used in wind tunnel calibrate. Not suitable for bulk distribution. Can be used under freezing conditions (heating). Electromagnetic interference from outside to ultrasonic probe. It is challenging to deal with storms over 60 m/s. There are many shortcomings such as large error in high wind speed area, dead zone in measuring around four wind axes and so on.. In the field of meteorology, Anemometer is usually necessary to observe many natural phenomena, such as changes in wind speed and weather, and of course, changes in wind direction. For the measurement of wind direction, the problem is basically solved by using wind direction meter or wind direction sensor equipment. We can find specific wind sensor observation guidelines on the official website of the World Meteorological Organization. In the work of sand control in desert and plateau areas, people usually need to pay attention to the change of velocity and direction of airflow, so that more meteorological data can be obtained and a better control plan can be worked out, so the wind direction sensor is used in the whole process. 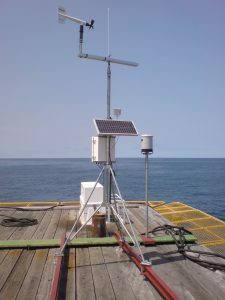 It can be said that the marine meteorological early warning system is one of the important applications of wind sensors in the meteorological field. It provides wind direction change data for the marine meteorological early warning system, and is one of the important parameters for predicting the typhoon coverage and “operation” trajectory. The ventilation equipments installed in the mine often have different models and different working power. Therefore, it is necessary to use the wind speed sensor to monitor the wind speed values of each ventilation, which is duct to prevent the phenomenon of excessive concentration of harmful gases due to the low ventilation rate at a certain location. In fact, in order to ensure the safety of production in large, medium and small coal mines, according to relevant regulations, wind speed sensor should be installed in coal mines. In each mining area, wing return air lane and total return air lane, wind speed sensor should be installed, and the driving face belongs to a part of the mining area, so the driving face needs to install wind speed sensor. In fact, there is another main reason for the need to install wind speed sensors in tunneling face, that is, harmful gases such as methane, carbon monoxide, and so on in coal mine, gas usually appear most likely from the tunneling face, and even some gases formed in the underground “chamber” are directly harmful gases. so it is necessary to install wind speed sensors in every position of coal mine, Connect ventilation equipment. In order to make better use of wind resources in modern large-scale wind turbines, the control of impeller direction is usually done not by the tail wing, but by the wind direction sensor. Usually, the wind direction sensor needs to be installed on the top of the wind turbine, but it needs to prevent impeller from impeding the sensor to measure if the height of the sensor reaches a certain level. At the same time, people also need to pay attention to the lightning protection and leakage protection of generator units and sensors. 1. Guarantee that the blades of wind turbines can be positively directed against the wind in real time to ensure that the facts are working normally. 2. The wind direction measuring instrument on the meteorological station equipment near the wind farm can ensure that the gale weather does not pose a threat to the wind turbine. 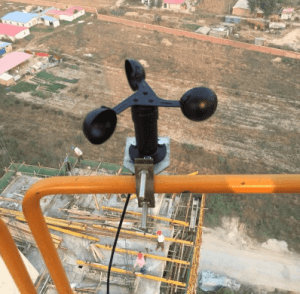 Usually, in order to ensure the progress of construction projects, most tower cranes usually install wind speed sensor. Its existence can make the crane alarm when the strong wind affects the crane’s work. But when the strong wind has begun to affect the crane’s work, it is often necessary to pay attention to the change of wind direction, so as to respond to different wind directions. So almost all cranes have used anemometer . VAV terminal device is one of the main equipment of VAV air conditioning system. Anemometer is also the key component of VAV terminal device. Therefore, the type and performance of anemometer directly affect the quality of detection and control of system air volume. At present, pitot tube anemometer is used in VAV terminal devices of domestic and European manufacturers, while pitot tube anemometer is not used in Japanese manufacturers. Airspeed tube on aircraft is a typical pitot tube anemometer, which is an extremely important measuring tool on aircraft. Its installation position must be in the area outside the aircraft where airflow is less affected by the aircraft, generally in front of the nose, vertical tail or wing tip. When the aircraft is flying forward, the airflow rushes into the airspeed tube, and the sensor at the end of the tube will feel the impact force of the airflow, i.e. the dynamic pressure. The faster the plane flies, the greater the dynamic pressure. If you compare the static pressure of the air with the dynamic pressure, you can know how fast the air rushes in, that is, how fast the plane flies. The tool for comparing the two pressures is a hollow circular box with corrugated surface made of two thin pieces of metal, called a diaphragm box. The box is sealed, but there is a tube connected to the airspeed tube. If the aircraft is fast, the dynamic pressure will increase, the pressure in the diaphragm box will increase, and the diaphragm box will bulge up. The deformation of the diaphragm box can be measured by a device consisting of a small lever and gears and displayed with a pointer. This is the simplest airspeed meter for an aircraft. The static pressure measured by the airspeed tube can also be used as the calculation parameters of the altimeter. If the diaphragm box is completely sealed, the pressure inside will always be equal to the pressure of air on the ground. In this way, when the aircraft flies into the air, the altitude increases and the static pressure measured by the airspeed tube decreases, the diaphragm box will bulge up, and the altitude of the aircraft can be measured by measuring the deformation of the diaphragm box. This altimeter is called a barometric altimeter. The speed measured by the airspeed tube is not the real speed of the aircraft relative to the ground, but the speed relative to the atmosphere, so it is called airspeed. If there is wind, the speed of the aircraft relative to the ground (terrestrial speed) should also be added to the wind speed (downwind flight) or subtracted from the wind speed (upwind flight). Wind shear is very harmful to aviation flight. In the process of takeoff and landing, due to the low flying speed, wind shear can have a great impact on the airspeed of the aircraft, resulting in sudden changes in attitude and altitude of the aircraft. At low altitudes, the results are sometimes catastrophic. At present, PM2.5 particulate matter pollution caused by site dust is obvious all over the world. Through wind speed and direction sensor, the flow direction of particulate matter pollutants can be tracked effectively, so as to effectively control its pollution diffusion. In some development zones, or chemical parks, the impact of harmful gas leakage is particularly significant. Anemometers can help to detect the spread of pollution sources. 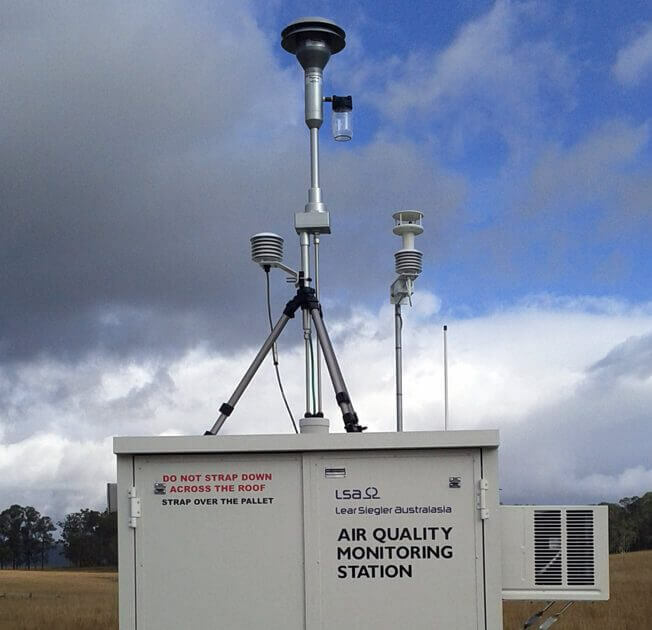 Anemometers should also be used in expensive super environmental monitoring stations. 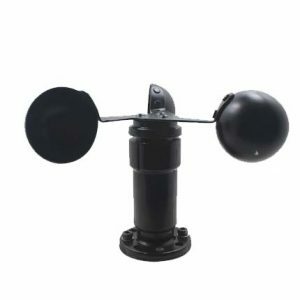 Let us help you choose the best anemometer in 2019. 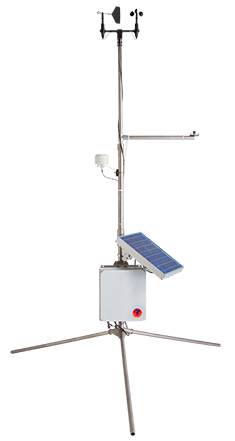 Wind sensor is an instrument that detects wind direction and speed through different technical principles. Ultrasound anemometer is mainly used to detect wind direction and speed by time difference method. No moving parts, long life. 1. Various principles, models and prices of wind measuring instruments should be selected according to the application scenarios. 2 If the scene needs, not only wind measurement, but also other meteorological elements, it is best to combine them. 3 Must consider whether need to maintain, this is an important indicator, but also the consideration of comprehensive cost. If you don’t know how to choose a suitable anemometer, please contact us. There’s always one for you.